The Razorbacks secured their second-consecutive SEC win with a 70-60 victory over the Georgia Bulldogs on Tuesday night. Mason Jones led the way for the Hogs, scoring 23 points on 8-of-14 shooting from the floor. FAYETTEVILLE – With the game tied 52-52 and 6:23 left in the game, Isaiah Joe and Mason Jones hit back-to-back 3-pointers and the Razorbacks never looked back in a 70-60 victory over Georgia Tuesday night at Bud Walton Arena. The 3-pointer by Joe was his only made field goal in the game. Jones not only led the team with 23 points, but he tied for the team lead with six rebounds and led the team with four assists. The Razorbacks won their second straight SEC game despite being out-rebounded by 24 (56-32). However, Arkansas only committed four turnovers – the third-lowest total ever by the Razorbacks – and blocked 14 shots – the most by the Razorbacks in an SEC game and fourth-most all-time. Arkansas got a basket at the buzzer by Jalen Harris to take a two-point lead at halftime (31-29). Arkansas rode that momentum to start the second half, leading by five (36-31) after a Gabe Osabuohien 3-pointer. The Bulldogs fought back and took a one-point lead, 41-40, after a Nicolas Claxton 3-pointer at the 13:47 mark. The Razorbacks answered with a run of their own and led by seven (52-45) courtesy of a Daniel Gafford Dunk with 8:32 left. However, Georgia rallied to tie the game at 52-52 on a 3-pointer by William Jackson III. From that point, Joe and Jones took over. Georgia temporarily got to within four, but Harris had a layup and Reggie Chaney blocked a shot on one end before racing down to convert a layup on the other to give Arkansas a 62-54 lead with 2:08 remaining. Arkansas made 7-of-10 free throws inside the final 1:34 to secure the win. Harris scored 13 points and had two blocked shots while Gafford added 11 points and four rejections. Chaney contributed six points, six rebounds and a career-high five blocked shots. Arkansas returns to the road to play at #19 LSU on Saturday (Feb 2. Tip-off set for 5 pm and the game will be telecast on the SEC Network. Georgia got off to an 11-2 start, but the Razorbacks answered with a 12-3 run to tie the game, 14-14 at 9:55. The Razorbacks took their first lead, 22-21, on a Mason Jones layup at 5:27. The Bulldogs regained the lead, but Jones answered with a jumper in the lane as the shot clock expired to put Arkansas back on top, 24-23. Jones ended a 2:57 scoring drought by the Razorbacks with a fast-break layup. Despite the drought, Arkansas only trailed by one, 27-26. Jones tied the game, 29-29, on a 3-pointers with 23 seconds left. Jalen Harris had a steal and lay-up with two seconds left to give Arkansas a 31-29 halftime lead. Mason Jones led Arkansas with 15, first-half points. SECOND HALF: Arkansas held Georgia to 28.2 percent shooting. Arkansas had nine of its 14 assists and nine of its 14 blocked shots in the second half. 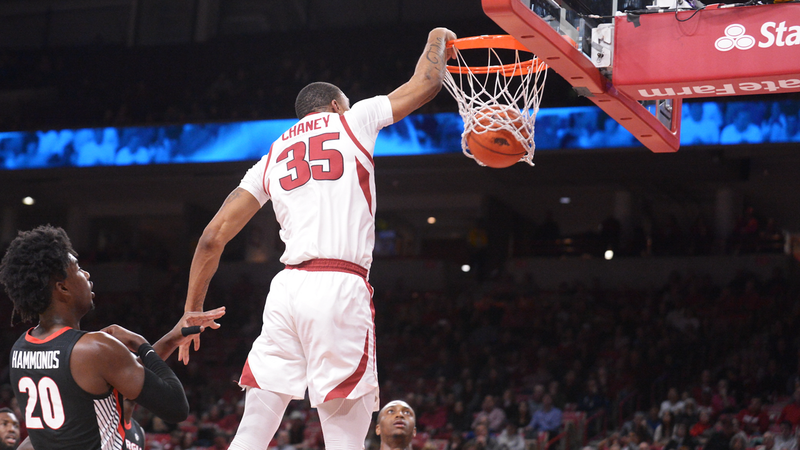 Arkansas’ starters were Isaiah Joe (G) – Jalen Harris (G) – Mason Jones (G) – Adrio Bailey (F) – Daniel Gafford (F). This has been Arkansas’ starting lineup in 18 of its 20 games. Georgia controlled the tip. The Bulldogs’ Nicolas Claxton scored the first points of the game, a layup at 19:40. Adrio Bailey scored the first points for Arkansas, a jumper at the 18:19 mark. Arkansas owns a 23-15 advantage in the all-time series with Georgia, is 11-3 versus the Bulldogs in Fayetteville and has won seven of the last nine including three straight. Isaiah Joe and Gabe Osabuohien each took charges, giving them 15 and 14, respectively, this season to rank 1-2 on the team. Arkansas has taken 40 charges through 20 games and had 47 in 35 games last season. Desi Sills hit a 3-pointer to cut Arkansas deficit to two, 12-10. It was his first 3-pointer made since he scored a career-high 14 at Texas A&M (Jan. 5), snapping an 0-for-7 drought from long-range. Jalen Harris hit a basket at three straight buzzers. At Texas Tech, he hit a 3-pointer inside the mid-court line to end the first half and give Arkansas a 33-30 lead. He also hit a layup to end the game to provide the 67-64 final in the Red Raiders favor. Versus Georgia, Harris got a steal and layup with two seconds left to give Arkansas a 31-29 lead at the break. As a team, Arkansas made a basket at the buzzer to end the first half in each of the last three games. In addition to Harris’ two buzzer beaters at the half, Daniel Gafford made a basket at the buzzer versus Missouri to make the score 34-32 in the Tigers favor. Mason Jones has led the team in scoring seven times this season, led the team in rebounding three times and led the team in assists six times. This is the second time Jones has led the team in scoring and rebounding in the same game and the fourth time he has led the team in scoring and assists in the same game.